Kelley McMorris illustration: Does Online Popularity Matter? When you're just starting at art, you don't have many measures of what "good" art is, or what it means to be a "successful" artist. The most accessible standard, the first one aspiring artists turn to, is online popularity. They think that the artists with lots of followers must be the successful ones who are making a lot of money. "Artist A has 100 followers, but Artist B has 30k followers, therefore Artist B is A Good Artist and I should try to be like them." "I have 4,400 watchers on Deviantart." "The fact that he started out by bragging how many watchers he has on Deviantart tells me all I need to know about where his mind is at," my friend said. "I gave him some fresh perspective." Guys, grab a coffee and sit down. As someone who's been "making it" as an artist for a few years now, I know some stuff that's difficult to see when you're a beginner looking in from the outside. Let me give you some fresh perspective. Employment means being employed at a studio or company, for example, being an animator at Disney. Freelance means working from home for various clients. Book illustrators like myself fall into this category. Direct sales means creating and selling products directly to the public, for example: prints, enamel pins, self-published books, web comics, etc. Depending on what you want to do, online popularity may or may not matter to you. Let's go over these three career paths one by one. Employment: online popularity doesn't really matter. Employers care about your resume and your portfolio, not about how many followers you have. There are many, many artists who are working at studios, making livings, developing big projects, who have little to no online following. Additionally, the art that tends to do well on social media isn't necessarily the stuff that studios want to see in your portfolio. Your drawing of Sherlock and Watson cuddling in front of the fireplace might go viral on Tumblr, but probably won't impress any future employers. So if employment is your goal, chasing online popularity is probably not the best use of your time. You don't have to convince the entire internet to like you; you just have to convince one company to hire you. Freelance: online popularity is helpful, not essential. Whenever I get a chance to meet an art director in person, I ask them how they find artists. So far, they've all mentioned social media as one of their top three sources. My drawing Dragonflower was used on the cover of Cricket magazine because the art director was Googling around for "dragon art!" However, social media is not the only way to get noticed. You can contact potential clients directly by using submission forms on their websites, sending them postcards, emailing them, or meeting them in person. Some successful freelance artists have little to no online presence. They may have agents who do their promoting for them, or they may have been working in the industry long enough that they have established relationships and a reputation. So social media can be good, but it's also not the only way to find clients. Direct sales: online popularity is important. If you're selling your own products, such as prints, enamel pins, self-published books, Kickstarters, webcomics, etc., then you need hundreds or thousands of customers. This is what's called a "fanbase," and usually, the bigger your fanbase, the better. Building a presence on social media should be considered a serious aspect of your business. When you hear people say, "Develop a brand! Start a mailing list! Post online frequently! Start a blog or YouTube channel! Post tutorials! Start a Patreon! Run a Kickstarter! Open an Etsy shop! Study the algorithms! Improve your SEO! Table at conventions!" - all that advice mostly applies to artists who are aiming to build a fanbase for a direct sales career. While social media is important, don't become obsessed with your numbers. 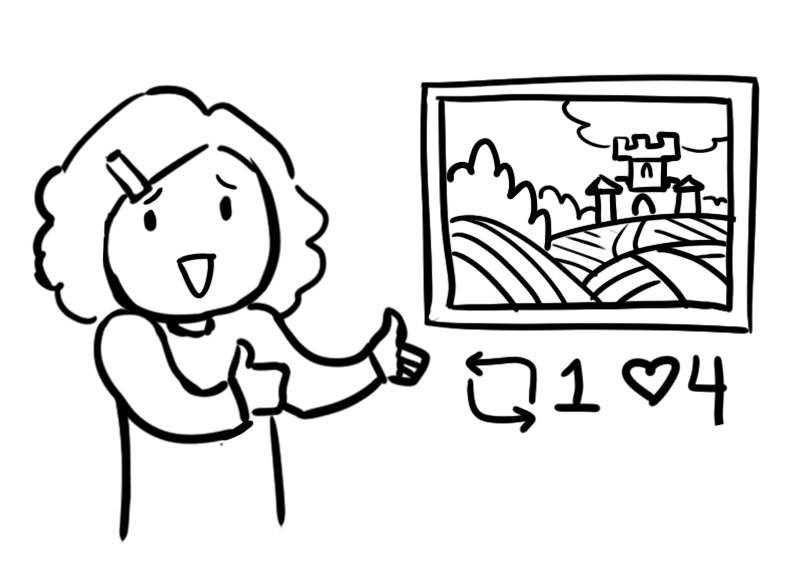 You can get sucked down into a spiral of people-pleasing, sticking to drawings that you believe will get "likes" instead of what you really enjoy drawing. Like everyone else who's trying to make a living as an artist, you'll have to find a balance between what you love to make and what people like to buy. In summary: think about how social media does or doesn't fit into your career goals. Either way, remember: online popularity isn't a measure of your value or skill as an artist. The illustration world is much, much bigger than numbers on social media profiles. There are many different paths to making a living as an artist, and becoming popular online is one possible path. It just happens to be the most visible one. Make Your Art Work: an online school focusing on business skills for artists. Check out their free PDF worksheets about "Getting You Found" and "Web Presence." The Creative Pep Talk Podcast: Relevant to freelancers and direct sales, Andy's topics cover how to find your style and niche and how to build an audience. One Fantastic Week: One of the best resources for learning about direct sales. A YouTube series and a week-long IRL workshop. 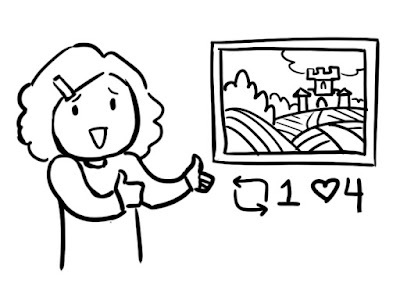 How to Get Started on Twitter: one of my blog posts, a pretty good primer on how to get started on most social media platforms as an artist, not only Twitter. Social Media for Artists and Illustrators: Holly Exley shares her thoughts in this good YouTube video. Thank you, this is just what I needed! Don't have really an online popularity and I've been wondering how important it is. I'm dreaming of Freelance career and I am building my portfolio right now. Hoping that I will get work by contacting directly clients and sending my portfolio to them when it is done! In summation: great work! Thank you! Thank you C. Desiree, that means a lot to me!